I’ve never understood beet-haters. I can fully sympathize with brussels-sprout-haters, for instance, since I even used to be one myself before realizing that a splash of olive oil and a turn in a hot oven make all the difference in the world. Also things like kale (so vegetal! so chewy!) and eggplant (slimy and bitter in the wrong hands) occasionally turn even my stomach, so I can fully comprehend why some people swear them off completely. But beets? To me they’re nothing but perfect, one of those few miraculous vegetables that manages to cloak a powerhouse of nutrition in a delicious package. So how come millions of reasonable, vegetable-loving folks hate them? Honestly, I can’t even count the number of people I’ve met who are otherwise passionate, equal-opportunity eaters, but don’t even bat an eyelash when proclaiming beets to be the one food they refuse to touch. So I ask you beet-haters, what is it you detest? Is it the flavor? I know they’re kind of earthy, but so are carrots, parsnips and sweet potatoes, and no one seems to have any issues with them. Is it the color? Granted, it’s intense, and it does admittedly, ahem, haunt you for a couple of days afterward (but that’s all I’m going to say on that topic), and it is a pain to remove beet stains from clothing, dishtowels and countertops, and people who’ve been handling cut beets look like they’ve just finished shooting a scene for a horror movie. Still, several kinds of ripe, red berries do all those things too (well, maybe not the haunting part…) and nobody hates them for it. I think what’s most likely is that people who think they hate beets just haven’t tried them in the right form. Heck, if I’d only tried them out of a can or jar, I might just hate them too. For one thing, they’re usually too sweet this way, since most manufacturers insist on augmenting their natural sugars to cloying levels. And texturally they’re not the most appealing either, water-logged and flabby, looking like freakish purple potato chips with all those crinkle-cut ridges. What can I say? Beet-haters, if this is the only way you’ve ever experienced them, you most certainly have my sympathies. But you don’t have my permission to continue hating them. At least, not until you’ve tried my favorite beet recipe. It’s a riff on a French cooked salad, where first the beets are roasted to caramelly softness, then sliced into garnet rounds and tossed with a mustardy, garlicky vinaigrette while still warm. At some point while they’re sitting there those sweet, sour and pungent flavors all sidle up to one another and get comfy, like good friends reunited after a long time apart, but just when you’re starting to fear that all this harmony might get boring, along comes a nugget of salty feta or the crunch of a toasted nut to liven things up. It’s addictive, I tell you; the first time I made this for Manuel, he went from saying, “you made beets… for dinner?? ?” to helping himself to the last few slices when I wasn’t looking. Not bad for a self-described “beet-ambivalent”. Now, I know beet-ambivalence a far cry from the full-fledged beet hatred many of you subscribe to, but please consider giving them another chance. You may be hesitant to take this advice from me, an avowed beet lover, but think of it this way: maybe, just maybe, there’s a good reason I am. And maybe, just maybe, this recipe marks the start of your life as a beet-lover too. A word of advice: wear something dark-colored while making this salad (and maybe while eating it too). As careful as you might be, some scarlet-red beet juice will end up on you somewhere. I’m pretty sure it has something to do with different laws of attraction between beets and white fabric, but if you have another theory, by all means share it. Preheat the oven to 400F/200C. Wash the beets, then wrap them in a double layer of aluminum foil. Place on a baking sheet and roast until a knife easily slides through the center of your largest beet, anywhere from about 45-75 minutes, depending on the size of your beets. Unwrap and allow to cool until you can comfortably handle them (they should still be warm, though). In a small bowl whisk together the vinaigrette ingredients until emulsified. When the beets are cool enough to handle, slip the skins off using either your fingers or a knife, and cut each beet into 1/4-inch (1/2-cm) slices. In a large bowl combine the warm beet slices and the vinaigrette, using your hands to gently massage everything together (it’s messy, but using a spoon usually results in too many broken beets). Let stand at least 30 minutes for the flavors to mingle – preferably more like an hour or two. Just before serving, taste the beets for seasoning – they might need another splash of vinegar and/or pinch of salt (though don’t overdo the salt since the feta is quite salty). Arrange the slices attractively on an platter, topped with the feta cheese, walnuts and thyme. Enjoy at room temperature. I’m not a beet-hater but I don’t particular love beets. It’s not the color. In fact, the colors are the reason I give the beet a chance every now and then. For me, it’s taste and texture…I’ll still give your recipe a try one of these days. I also did not appreciate beets until last year, but I would eat the occasional take-out beet salad, a la traditional sugar-laden Jewish caterer. Now that I’ve discovered organic beets, preferably golden, I’m in love. Roasted beets are like crack. My sister and I sit at the table and scarf them down. We tried to roast conventional beets and had to *throw them out*. They were tasteless! So this is a spring-summer treat only. I may try your recipe…if there are any beets left after they’ve been "tasted". i am a beet lover and i have my beets diced with a similar dressing too. only, no feta and walnuts, just chopped red onion and lots of fresh coriander leaves. and yes, i finish it all up. I have not tried beets cuz it is not the most common food here. But I will give it a try the next time I see it at the market. Now, see if I had been introduced to beets like that when I was younger, I might not have such an aversion. I am working on it and your recipe will help!!! I admit it, I’m a beet hater. And I think I fit your bill since I’d describe myself as an equal-opportunity eater otherwise. But I’m honestly not sure if I’d be willing to give you recipe a chance, though it does sound interesting. My wife loves beets and makes them whenever she has a chance — she just simmers, peels, and slices them. Every once in a while I wonder why she enjoys them so much and give them a try. The first bite is generally edible and I wonder if I should try to like them. But by the second or third bite I can’t continue.For me the main thing is the smell. It’s overpowering in the literal sense that once there are beets in the air you’re not going to be noticing anything else. It’s absolutely unlike anything else, but it’s overpowering in the same way that being near a paper plant can be overpowering — you just can’t get away from it. Second is the taste. They’re cloyingly sweet — and I’m not talking about the ones with added sweetener. I can’t imagine why anyone would add sweetener to beets.But for any other beet haters out there I will say one thing: beet greens are rather good. They tone down the beet taste quite a bit and don’t have the rubbery-jello texture of the beets themselves. So if you’ve stayed away from the greens because of the taste of the beets you might want to give them a try. I never understood beet haters for the longest time. My mother always bought them fresh, and made salads similar to the one in this post. Then we moved back to the U.S. (from France) where the only way she could get them, until farmers markets were prevalent, was in cans. That’s when I understood why people dislike them so much. You’re right: so much crap is added to canned beets to ostensibly improve their taste, prolong their life, and so on. It’s awful! Hi,Good post. I love beets.For beet haters. Try this beetroot jam and am sure you will be coverted!http://enrichingyourkid.blogspot.com/2009/10/beetroot-jam.htmlShirley. sorry typo error I meant converted. it’s that nasty stuff you find at the salad bar, that’s what kept me away for years! now i can’t get enough of them, especially the golden ones. Love beets. Absolutely and with no reservations. This recipe makes me love them even more. Sounds perfect for these hot summer evenings now making their appearance in Cape Town. In many countries including vegetable loving Italy, you’ll usually find only the precooked variety, attractive as an overboiled cabbage, roughly. I simply ignored them, until a friend who runs a fantastic agriturismo prepared a risotto with grated fresh beetroot, lemon zest and fresh sheep cheese. It looked and tasted so amazing, I became an instant fan – and furthermore, when I made it for my father, it turned out this was one of the dishes my long gone grand-grandmother used to cook, 1500 kilometers further north! While I’ve never felt anything toward beets besides adoration, I’m excited to try your recipe. One can never have too many beet recipes. I recently found your blog and it is now one of my favorite. It is beautiful, well-designed and wonderfully written. Actually, your writing is my favorite part. Keep up the wonderful work. There must be a beetroot virus going round as I’ve recently made barszcz. http://www.threespoons.co.nz/2009/10/two-suitcases.htmlI love ’em in all forms, but down here in New Zealand (also next door in Australia) the sliced pickled ones are a common burger topping. With all that salt and sugar in them you can just think of them like a relish or chutney. I am a beet-lover, child of a mixed marriage: my mother loves them, my father hates them. So we never ate them when I was a kid.I can completely understand why someone would hate them–the very thing I love about them, their sweet-dirt taste, I imagine is horrid to the beet-hater. I can’t stand beets, and I’ve tried really heard. Recently I’ve heard that beet-liking is a genetic thing, where some people have a taste receptor that makes beets taste awful. There’s a similar thing cilantro and, ahem, smelling the effects of asparagus. But I’ll keep trying! 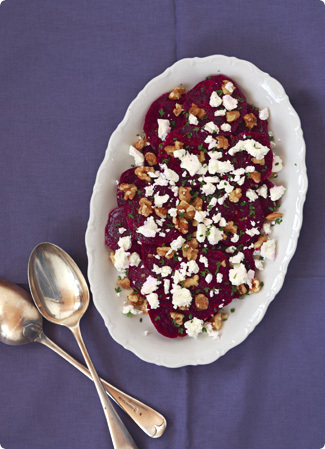 Lovely recipe – the beet-feta-walnut-mustard combo sounds truly delicious. I’m a beet lover, and have been that forever (you kind of have to, living where I do 🙂 However, I can name quite a few lovely foodbloggers who detest the vegetable!?! Shocking, i know. I’m going to experiment with yellow beets in my new garden next year – perhaps that will win over some of the colour-averse..PS I love the sound of beet-shallots-sage dish that Noëlle mentions, too. Ugh! Shudder! I can’t stand beets, and I like most other veggies (though not big on eating large pieces of cooked carrots). I’ve tried beets every which way. I’ve had fancy beets at upscale restaurants and I’ve had them at old folks-type steak houses. I’ve made them myself. Roasted them. Boiled them. Freshly picked farmer’s market ones too. Not the tired old withered grocery store beets (which nobody seems to buy, so they just kind of waste away on the shelf).I’ve hated them all.I WISH I liked beets. The color is gorgeous (whether the traditional ruby red or the more orange color), and of course, they’re healthful. Unfortunately the taste gives me a gag reflex, and has ever since I first tasted them as a child.I envy people who can enjoy beets. I really do. I adore this post and all the passionate enthusiasm about the humble beet. I have been told, on more than one occasion and by friends who know me well, that I have a beet fetish. One of the reasons I love them is that they’re so strange. I put them right next to Brussels sprouts as a reminder of how amazing these things that grow out of the ground can be. nice one….it’s not very common here in Malaysia. but i really want to try it out!! Hello! I randomly found your blogs through one of the other cooking websites I was venturing through…I love love LOVE beets. I don’t understand the beet haters either, I mean honestly what’s not to like? 🙂 I will definitely be trying out this recipe thanks for the post! In Bulgaria we add sliced garlic and chopped parsley to the vinaigrette, no mustard, no black pepper. My experience is you do not over- or undercook the beets. If they crash when mixed whit a spun they are overcooked. If not coked enough, they are not tasty and the earth smell and taste are more noticeable. Also, when you buy beets smell them, inspect for fungi, damages, black spots. It is possible they are stored wrongly, diseased or just very old. Washing the beets thorough is essential for the smell. Cut tiny roots and very low the steams before wrapping and baking. Choose big, fist size, same size beets.Enjoy! me again …Kristel of Kristel’s Kitchen described the taste as "rotting lettuce leaves." And, you know, I think she hit it on the head! That’s the smell/taste that I couldn’t explain. Thank you Kristin. I am sorry to say but I’m also from the beet-hater camp. Why? No idea.. Its the taste I guess.. Seriously, I consider myself a foody and there is no other vegetable that I’d dislike – I absolutely adore sprouts or eggplants for example – but beets.. no.. I just cant eat them. Sorry, but I’ll have to pass..
"haunt" ::snort:: hilarious! !I was a beet hater from childhood until I had them roasted, gently tossed with herb infused olive oil and eaten straight from the steamy hot pan. And I was able to turn my husband into a beet obsessed salesman with roasted beets, fresh baby arugula tossed with lemon juice, olive oil, sea salt, a smidgen of yummy goat cheese and a few slices of fresh avocado. seriously I think I could survive on this salad for lunch, for the rest of my life. So delicious! !Wow…now I really want some beets…AND kale. But not together because well, that’s just pushing it! Good post. I love beets. Wow! Your post made me want to give beets a try. Apparently I liked and ate them as a toddler. The only kind I have been exposed to in adulthood has been the processed kind so I can’t honestly say I "don’t" like them. I am definitely willing to give them a chance. Can’t wait to give them a go. I love the words of advice..I always end up with beets somewhere on my clothes, neck, fingernails…you name it. I love beets and this salad looks lovely. Was so inspired I actually tried this recipe for my BD dinner last night. Super scrumptious! Thanks Melissa! I love beets too! And I love Marmite and am not afraid to admit it!! Here in Fez, Morocco there’s a nice twist to this salad. Instead of a mustardy dressing, this summer we’ve been using orange-blossom water adding the most amazingly subtle but refreshing flavour to fresh beets. Loved this post, really made me giggle AND want more beets – what a fabulous combo! See, I love all root vegetables and squashes, but I basically hate all peppers. Not liking peppers gets me the stink-eye often, but nobody cares if you don’t like butternut squash or beets, mostly because they’re not in like, every single recipe, ever. But peppers are. So, thanks for a beet recipe! Interesting! It does sound like there might be a genetic factor. I like beets, even though I have a strong conditioned aversion (in addition to the naturally occurring aversion) to rotting vegetable smell, having once been forced to carry around some rotting celery in my pack at summer camp. Delicious salad! My hubs doesn’t like beets but I adore them and insist on growing them every year in the garden. He’ll eat the greens so he does get something out of the endeavor. I like to pickle the beets themselves using my gran’s recipe which is not too sweet. I agree about the canned version of pickled beets though- disgusting texture and sweetness level. Homemade pickled beets tossed with red onion and sour cream is a divine dish although it does have a dayglo hot pink eeryness to it. I just tried out the recipe. Sooo delicious. I love beets. Also, the dressing would be great for other roasted veggies. Thanks for what you do. Oh, I so agree — I could eat these beets for days. Though I sometimes through in a sectioned orange or two, which snuggles up nicely. Looks like you’re settling into your new home nicely — congrats! Great idea for a salad. love the blog some wonderful recipe ideas. I teach on a few cookery Holidays around the world and I will definitely be recommending this blog to my students. I made this for a wine tasting event I went to over the weekend, it was a huge hit. Everyone loved it, even those not typically given to being culinarily adventurous. I keep trying to like beets, but I just can’t stand them. They taste like dirt to me – dirt with sugar mixed in. Ick! I am a recent beet convert… My husband LOVES beets, and I had only tried canned/jarred varieties prior <yuck>, but a neighbor offered his own home-grown variety last summer and insisted all I had to do was boil them for a bit and add a bit of salt and butter, so I tried it…OMG! I didn’t even add the salt & butter! which I might say wouldn’t have hurt, but they were so yummy that I didn’t want to mask them in any way… Now, if you have any suggestions for Liver…. I recently started seeking out the foods I disliked as a child. To my surprise and delight, I’ve been turned on to asparagus, Brussels sprouts, tongue, and single malt scotch. So it was with high expectations that I recently tried beets again. Not boiled like my mom used to make them, but served as a spiced Moroccan salad. I had high hopes. Alas. No good! Full stop! Couldn’t stand them. Something at the end of the first taste, at the back of my tongue, made me shudder. Apparently I have not matured enough (or killed off enough taste buds in my middle age) to allow me to enjoy beets. No matter. My parents cannot abide cilantro. Therefore, they can eat all the beets they want. I shall eat gardens of cilantro. We all shall be happy. i am a convert to beetroots, but i still am not keen on them pickled – that put me off them for years, even home-made pickles, and the shop made ones are far worse! i love them in soup, or grated and raw, but what really turned me round on them was when a friend grated and fried them for me with fresh squeezed oj and a little cream of horseradish. they are also fabulous with lemon juice and ginger, the acidity and spice offsets their earthy sweetness to perfection. I decided to try your Beet salad because I am making a true effort to eat the colors of the rainbow. This turned out fabulous. My husband, who is a beet lover, loved this recipe. Definitely a keeper. It was so simple to make and I plan to try the vinaigrette on other vegetables/salads.